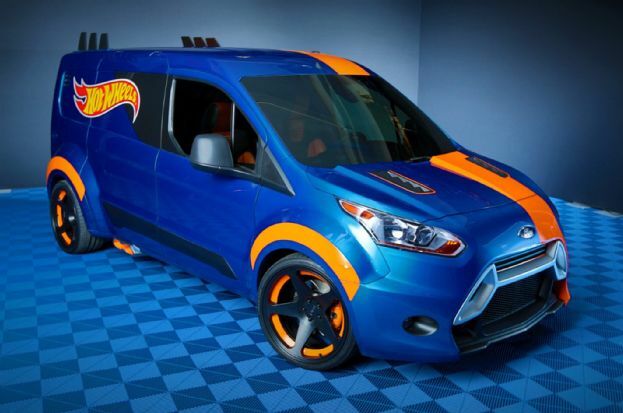 If you were (or are) a fan of toy cars you’ll love what Ford displayed at the Specialty Equipment Market Association event (SEMA) in Las Vegas last week: a 2014 Hot Wheels Transit Connect! Hot Wheels has been working to create vehicles for Ford since 2001. This year, Felix Holst, the VP of creative for Mattel Wheels Division said “the Hot Wheels design team jumped at the chance to hot rod a Transit Connect van. The idea was to create a race-inspired support vehicle for the average guy to spend a weekend at the track testing his Hot Wheels race car.” The Transit Connect is decked out with two 18-inch tablets, a 55-inch TV screen, gullwing doors and a built-in Hot Wheels® drag strip. Holst adds, “It even has slide-out drawers to keep your favorite Hot Wheels cars with you at all times.” To learn more about the 2014 Hot Wheels Transit Connect or to read the entire Ford press release click here.